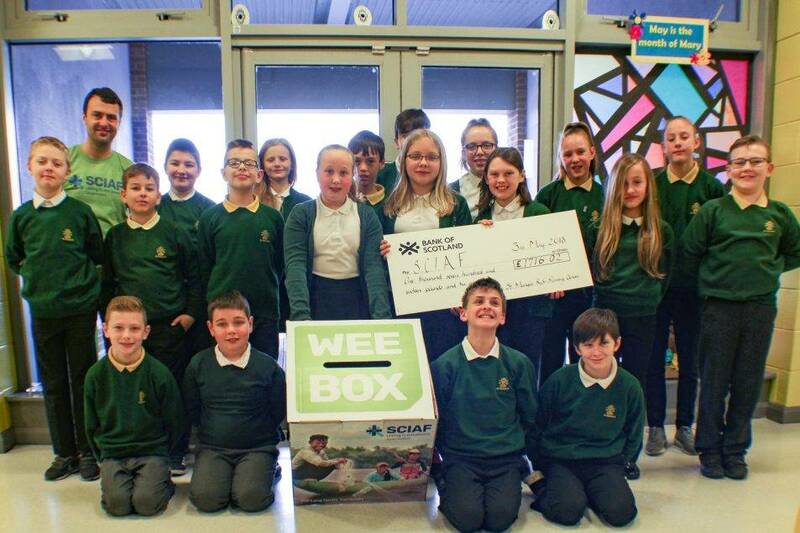 St Mungo’s, Aloa, 6/7 class successfully planned and led a fundraising campaign for SCIAF during Lent. They were slightly concerned that they would not be as successful as previous years as Ash Wednesday fell in our February half term and then the snow came and interrupted their initial activities. All that aside, they still managed to reschedule and change events and have a very successful school fundraising event. Fairtrade Macaroon were made to sell at lunchtimes and filled a jar with a variety of Easter eggs so children could pay to ‘Guess How Many Eggs’ were in the jar. The children had planned an Outdoor Obstacle Course for each class to participate in but the weather was so bad that it had to held indoors. A Fairtrade Coffee Afternoon was held for families and friends of the school and had a ‘Sponsored Scoot Aboot’ School. This was by far our most successful event and the children had great fun bringing in their bikes and scooters to see how many laps they could do. The final event was a dress down day that was combined with a Crazy Hair day. P6/7, planned all these events as part of their topic work and in class they were also learning about the valuable contributions SCIAF makes. In class the children did a comparative study between Scotland and Cambodia.